The PerfPro Breathable Pallet Cover is designed to allow breathable sides on the perimeter while maintaining the water resistant properties on the top of the pallet. This type of cover allows the pallet to be extremely breathable with a vapor permeable membrane along the sides and a top sheet membrane impermeable to rain on the top. Flexpak has designed this pallet cover for heavy moisture content found in freshly cut lumber and wood products. 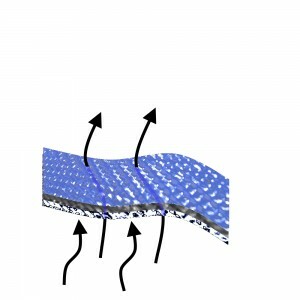 The airflow allows moisture to escape through vapor permeable woven or poly material. The design of the pallet cover is not limited to a single thickness of plastic or print. The sides and the top can be manufactured in either woven plastic or plastic sheeting materials. With PerfPro’s breathable pallet cover design the top can maintain a woven lumber wrap like material while the sides can maintain the properties of a different poly. This allows for a tear and wear resistant top to the pallet cover while also allowing high graphic print to run the length of the entire pallet. With such a design there is great breathability, high graphics, and strength for pallet stacking in the yard or by shipment. When the top and the sides are designed with different plastics there can be cost-effective solutions found in the design. See VentEnd Breathable Lumber Covers and Breathable Covers for more information regarding different pallet cover options with breathable properties. Flexpak has several solutions that help control moisture issues. Contact Flexpak at any point for more information.